At some point in our lives, we’re all victims of unsought counsel. We receive input on our marriages, parenting skills, health, career and clothing. 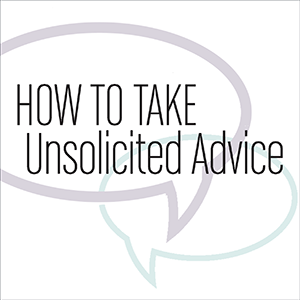 Does the Bible say anything about responding to unsolicited advice? Instead of searching Scripture for stinging psalms or passages that use the word “smite,” we might consider the story recorded in John 2: the wedding at Cana, where Jesus received advice from His mother. In this passage Mary saw a problem that Jesus could solve. The pitchers of wine—the lifeblood of the wedding feast—had been drained. Knowing her Son’s capabilities and the social repercussions if the hosts ran out of wine, Mary suggested that Jesus do something. Jesus’ reply—“My hour has not yet come”—indicates Mary may have wanted Jesus to solve the wine shortage in a way that would reveal Him as the Messiah. He openly told her He didn’t intend to follow this suggestion. What can we glean from this? In following Jesus’ example, we should be cautious about misleading those who offer advice. If we have a good reason for declining a suggestion, we should honestly communicate our intentions. But if we struggle to find a good reason to refuse an idea, maybe we need to reconsider. Of course, this story isn’t only about the manner in which we respond to advice-givers. Often, second-rate suggestions expose important issues that have escaped our attention. In Jesus’ day, serving wine wasn’t merely a celebratory addition to a good party; it was the responsibility of the host to provide wine for the duration of the seven-day feast—running out of wine had social and financial consequences. Jesus did not solve the wine shortage the way Mary had intended, but He was willing to consider His mother’s opinion and address the predicament of the hosts. For us, good advice often comes from unexpected sources. Children sometimes provide fresh insights; seasoned leaders sometimes offer unwise counsel. We must prayerfully weigh each suggestion on its own merit. Instead of accepting or rejecting Mary’s advice outright, Jesus humbly and strategically modified Mary’s suggestion and solved the wine shortage privately. At the end of the feast, everyone enjoyed the best wine, the hosts avoided disgrace, and only a few servants knew a miracle had occurred. Most important, Jesus’ disciples believed in Him. Jesus performed His first miracle in response to unsolicited advice. And He manifested the light of His glory in Cana of Galilee. His example teaches me that I have to respond wisely to each suggestion. Who knows? A book placed in my hand by a church member might be from God after all. Jesus is not being disrespectful to Mary when He uses the term “woman” (gynē, γυνή). He uses this polite address when speaking to other women in John’s Gospel (John 4:21; 8:10; 20:15). He also uses the term from the cross when addressing Mary in a loving, caring way (John 19:26).